Donald Trump has said he will probably meet Russian President Vladimir Putin during a trip to Europe in July. He said the meeting is likely to happen in Helsinki, Finland, or the Austrian capital Vienna. A foreign affairs adviser to Mr Putin said earlier that Moscow and Washington had agreed on the date and location for a summit, but said details would not be released until Thursday. Russian president Vladimir Putin earlier met Mr Trump's national security adviser for talks intended to set the stage for the US-Russian summit. 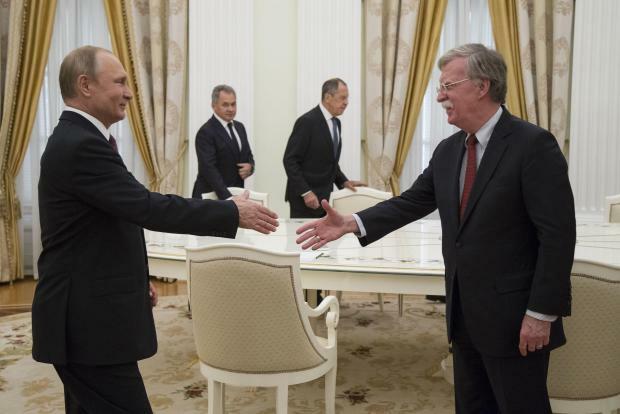 As he greeted John Bolton in the Kremlin, Mr Putin noted that US-Russian relations are at a low point, which he said was mostly due to US political infighting. He voiced hope that Mr Bolton's visit would make the first steps toward improving ties. The Russian president added that Russia never wanted a confrontation with the US, offering to discuss what can be done to "restore full-fledged relations based on equality and mutual respect". Mr Bolton said he was looking forward to discussing "how to improve Russia-US relations and find areas where we can agree and make progress together". He added that when Moscow and Washington had differences in the past, Russian and US leaders met and that was "good for both countries, good for stability in the world". Mr Bolton noted that "President Trump feels very strongly on that subject". The US adviser said that he would like to hear Mr Putin's account of "how you handled the World Cup so successfully" in anticipation of the United States co-hosting the 2026 World Cup.